The Moustache Samedi 27 Open Xroad 3 is a multi-purpose grafter that offers something a little bit special. It’s not like other e-bikes! The Xroad 3 Open boasts sleek lines, stunning looks and performance to match. The semi-step frame design ensures easy on and off the bike as well as confident riding. The introduction of a small 39cm frame enables even the most petite rider to enjoy the Samedi. If it’s an all rounder of an e-bike you’re looking for, then the Samedi 27 Open Xroad 3 from Moustache is hard to beat. Why buy several different bikes for differing rides when one will do the lot! This gutsy performer is an urban, touring and hard tail mountain bike all wrapped up in one. Moustache have worked hard to develop such a thing of beauty, and they’ve succeeded in style. Designed in response to the demands of a multitude of riders, eager for such a multi-purpose electric bike, the Xroad 3 was born. Gentle enough for commuting and touring, the Xroad 3 equally has wheels, front suspension and gearbox for full off-road use. The all round nature of the 27.5″ tyre is at the heart of the Open Xroad 3. Fit a pair of Hutchinson Python tyres sporting a plethora of mini studs, and the end result is a tyre with excellent roll but with equally good comfort and traction. Hard tarmac roads, railway cuttings, canal tow paths and loose ground are easily dealt with. It’s strong too. With Moustache exclusive 27.5″ wheels (23mm wide) double cavity welded asymmetrical rims, the Xroad 3 can deliver great performance. A nice pair of XCM ATB forks ensure versatility and ease of adaptability, whatever the terrain.A wide 11-40T cassette ensures broad gear ratios and easy hill climbing. 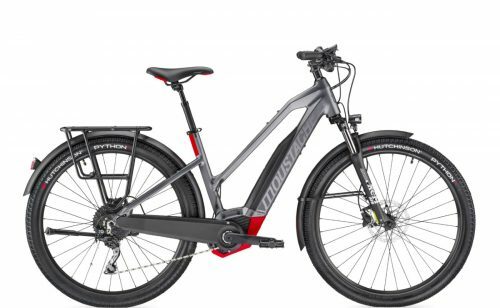 A Shimano Deore 10-speed derailleur works a treat on this stunning e-bike. Working in unison with Shimano Rapidfire shifters, means gear changes are slick, clean and true. Hydraulic disc brakes from Shimano acting on 180mm and 160mm rotors ensure effective braking at all times. Equipped with a mudguards, ORTLIEB-ready luggage rack, kickstand and high-performance lighting, the Samedi 27 Open Xroad 3 has everything it needs for outstanding performance.